So, we’re going to talk about two recipes today. This week’s recipe, Next-Day Beef Salad, and one from quite some time ago, Orange-Almond Tart. For some reason I put off trying Next-Day Beef Salad because I thought it required leftover beef tenderloin from Boeuf à la Ficelle. Turns out you can use pretty much any leftover beef. I used top sirloin, but I can see how something a little more tender would be better. 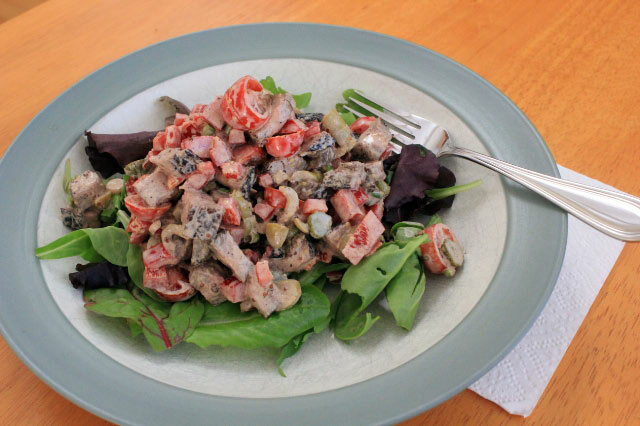 This salad was created when Dorie made an attempt at clearing out a variety of leftovers. She gives us a specific recipe, but also gives us permission to play around with it. The recipe starts with the beef and a simple dressing of mayonnaise and mustard. I added in green onions, Picholine olives, cornichons, grape tomatoes, and red bell pepper. Tossed together, I served my salad on a bed of mixed greens. This was good! I really enjoyed the flavor of the mustard dressing with the beef. This is a great recipe to keep in mind when you have leftover roast beef and want to use it for something a little different. 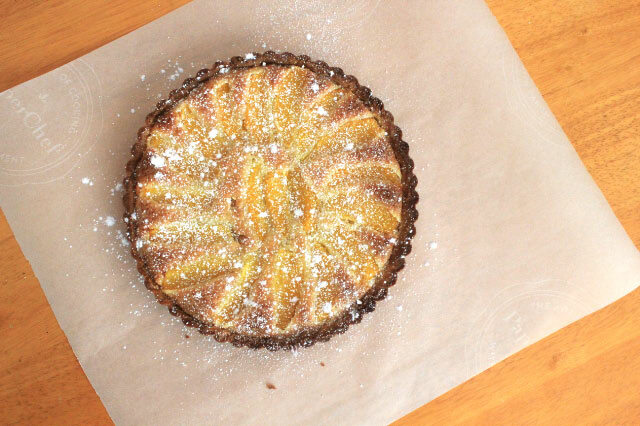 The group made Orange-Almond Tart way back in February 2011. I chose not to make it at the time because we just didn’t need to have a big dessert. If I had known back then that I would be on track to complete every recipe from Around My French Table, I might not have skipped it. 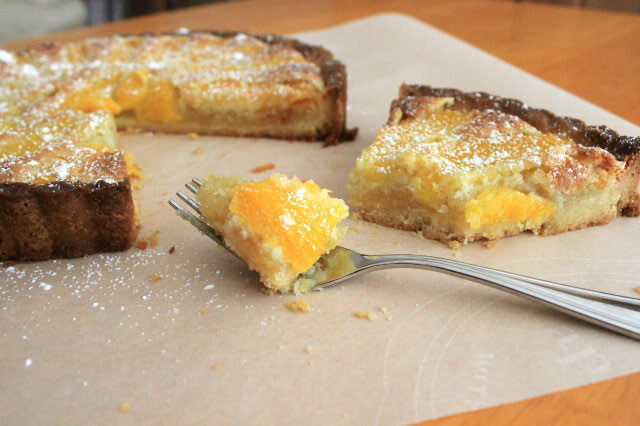 Orange-Almond Tart is a riff on the classic Pear and Almond Tart. It still has the pâte sablée crust and the almond cream, but the pears are replaced with oranges. Why did I wait so long to try this tart? I knew I would like it because, you know, dessert. But I didn’t expect to love, love, love it! I loved the unexpected burst of orange juice. The flavor went so well with the creamy almond filling and the tender, sweet crust. 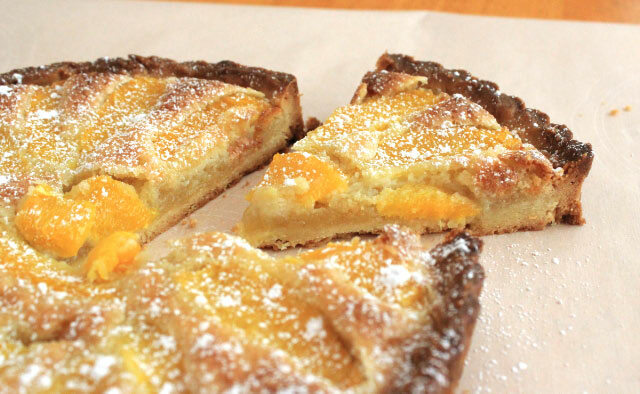 Making this tart was a reminder how much I like Dorie’s Sweet Tart Dough recipe. There you have it! I look forward to finishing the final stretch of recipes with 100% completion! Have a great weekend! I loved this salad too. I used leftover steak, you’re right any beef will do. And thanks for reminding me about that tart. I remember that being one of my favorite desserts in the book. I made it a few times after it was assigned and then forgot about it. It seems to me it’s good even without any fruit on top. Congratulations on being completely caught up. I’m jealous! Yay! Congratulations on catching up. I remember how good it felt when I finally caught up the first four recipes that I missed. It felt like a major accomplishment. I am excited too and very proud of you. Actually I thought only Mardi had completed all the recipes up to now. Cher has done it. You have done it. You all are bright shining stars of FFWD. I haven’t made the Orange-Almond Tart yet. It goes on my List and moves to the top because of your recommendation. Nice Post, Karen. the make-ups, I have been trying to do that too. Have 6 more to go. Wow, what a double-header!! I loved this salad too – such an interesting combination of flavors and textures! Yours looks delicious! And, oh, the tart. I’m jealous. I have only made it once. Did not expect to like it. But it was amazing. Maybe I need to make it again? And congratulations!!! Like Trevor, I would have a lot of making-up to get to 100%, so that makes me even more proud of you. Well done! You deserve every one of those exclamation marks!!!! That’s quite an accomplishment. I have long had two malingering on my make-up list which I think are just going to have to stay there. For one I’m lacking the requisite electric mixer to get the job done and for the second I’m lacking the requisite motivation, because it was so widely panned by all the other Doristas who made it on time. I love the sweet tart dough recipe! its amazing! 🙂 I need to make this one!! I love that you are on-track! I have enough recipes to make up where I might be done if I get one thing made per day til we are done, you are an inspiration! The salad was really good – I guess when most of the ingredients would also make for a great roast beef sandwich, you can’t go wrong. And that tart was so good – I will have to revisit it sometime. This was a really good salad…and I’m sure it will be a regular on our menu over the summer! Your tart looks lovely…I remember loving that one! Soooo good! Oooooh, that tart is fabulous and that’s great you all enjoyed it! When I made it for a dinner party, someone asked where the french bakery was that I’d gotten it from. It was a nice compliment. Hey, congrats on being all caught up!! From Scratch · A blog about cooking and sewing and whatever else inspires me.